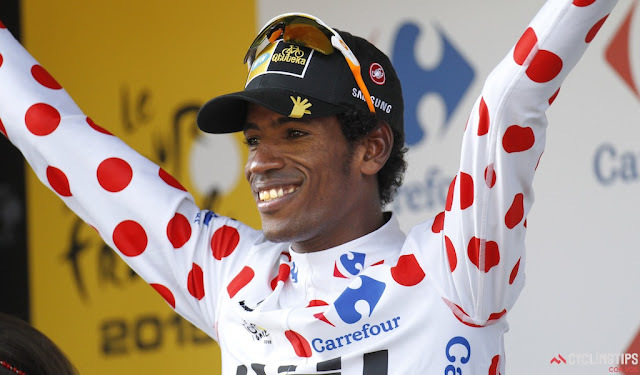 Eritrean rider Daniel Teklehaimanot becomes the first African to wear the KOM jersey in the Tour de France and the first black African to wear a Tour de France classification jersey of any kind. Tour de France leader Chris Froome says he expects east Africans to one day dominate cycling the way they do distance running. Ethiopians and Kenyans have been streaks ahead of the competition in long distance running for decades. They also tend to dominate middle distances and have even been creeping down to enjoy success at 800m. And when it's not a Kenyan or Ethiopian at the front, such as the London Olympics in 2012 when Mo Farah won double gold over 5,000m and 10,000m, even that was achieved by an athlete with Somalian, and hence east African roots. But so far in cycling, another endurance sport, east Africans have yet to make a ripple. That has begun to change at this year's Tour with the first ever participants from the region taking part in the form of Eritreans Daniel Teklehaimanot and Merhawi Kudus. Teklehaimanot, 26, is even the current holder of the polkadot king of the mountains jersey and sits a very respectable 111th out of 185 riders. Kudus, 22, has been quiet so far but sits 166th and one place above former two-time Giro d'Italia winner Ivan Basso -- he may be just waiting for the high mountains. According to Froome, a time will come when east Africans are leading from the front. "I believe athletes from east Africa are potentially the best endurance athletes in the world given their physiology and their upbringing at altitude," said the Kenyan-born Briton. "At the moment the biggest problem they're struggling with is infrastructure, the roads to train on, equipment, and the federations are a bit of a mess. "It's the wild west up there but I really think it's a huge area for development for the future. "There are already a couple of projects -- there's the Safari Simbaz project I'm involved with; Kenyan Riders also have a project out there. "It's really interesting results that they're yielding and I don't think it's going to be too long before we see some real results coming out of east Africa." Teklehaimanot has proved over the last month that he has great potential, winning the mountains jersey at the June Criterium du Dauphine and getting in breakaways on successive days at the Tour de France. He has made a deliberate effort to be visible during the Tour to raise the profile of his MTN-Qhubeka team, the first ever African outfit invited to the Grand Boucle. Qhubeka have a project that aims at getting talented African riders into the professional ranks. They're also hoping to raise money to buy 5,000 bicycles for African children and Teklehaimanot believes his presence in the polkadot jersey, meaning he is on the podium at the end of each stage, is helping towards that goal. "I am excited to be able to show my team's colours on the podium because we are trying to give 5,000 bicycles to African students -- being on the podium will help our project and I want to help make a difference for my African people," he said after snatching the jersey on Thursday.